In a quiet gym, the 6-foot-1 guard is smiling as he runs through a pre-game drill in the team’s layup line. He’s laughing with his teammates and casually puts shots up. In a manner of minutes, Gage is set to begin his last journey competing in the Chicago Public League playoffs. 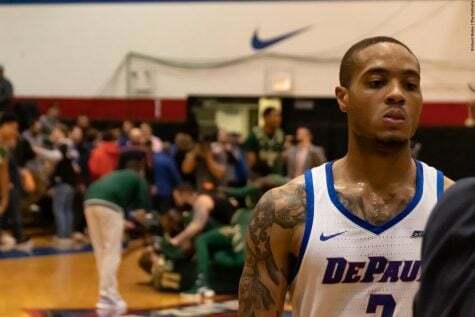 As the best player on Curie, one of the premier basketball schools in the city, and a DePaul commit, the pressures for Gage to compete are certainly there — both his team’s and his own. The thought of leading Curie to a city title or Gage’s motivation to prove he’s one of the best players in Chicago is in the back of his mind. But for now, it’s game time. [dropcap]C[/dropcap]ompetitiveness struck Gage at an early age. Before he started playing basketball, Gage’s first sport was boxing, which he was introduced to at age 3 by his grandfather as a way to let out his energy. His grandmother would always note of Gage’s “anger problem” and try to get him to relax. But it wasn’t just boxing that Gage tried out. He dabbled in karate and played pee-wee football before his mother insisted he stop over safety concerns, though Gage jokes it’s because he popped too many footballs. No matter the sport, though, Gage’s mother, Wanda Gage, noticed the ways her son applied himself. But it was basketball that stuck. When Gage entered the third grade, he took up the sport, and it was no surprise to the rest of his family. After all, basketball was already a major influence. 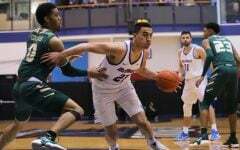 Gage’s older brother, Derwin Jr., was the athlete in the family and already a standout high school player at Whitney Young and Proviso East. Eight years older, Devin studied Derwin’s game, while Wanda often noticed how the two stuck close together. There was no sibling rivalry, just admiration. It wasn’t until Gage hit sixth grade, however, that he started realizing that he had talent. It was then when Gage started competing in the Athletic Amateur Union (AAU) and was vastly superior than the rest of the kids he went against. The noticeable jump in talent even took his older brother for surprise. 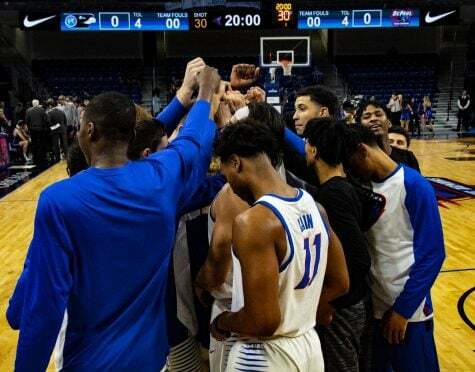 At the time, Derwin was living in Atlanta, playing basketball at Southern Poly College, and when he came back to visit, his friends couldn’t stop talking about his younger brother. [dropcap]I[/dropcap]t’s the first round of the Public League playoffs and Curie is scheduled to play against Taft, a middle-of-the-pack team. From the beginning of the game, the difference in size and the quality of athletes is readily apparent. Gage is rested. Before the game, he took an ice bath to soak his body. For weeks now, Gage has been dealing with a sore right ankle, causing him to miss a pivotal game against rival Kenwood. Against Taft, though, Gage is everywhere when he is needed. From the start, Gage quickly attacks the basket — his key characteristic — and gets to the rim with relative ease. Even on the defensive end, Gage makes his superior athleticism felt. After missing a chance for an alley oop, Gage sprints down the floor on what seems like an easy Taft fast break. Yet as the opposing player goes up for layup, Gage jumps from the paint and rises in the air. Just like that, Gage stops the easy basket with an eye-opening one-handed block. “I could have made the oop, but I had to get in another spectacular play,” Gage said, smiling. The move did not come completely consequence-free. As he landed, Gage re-rolled his ankle. 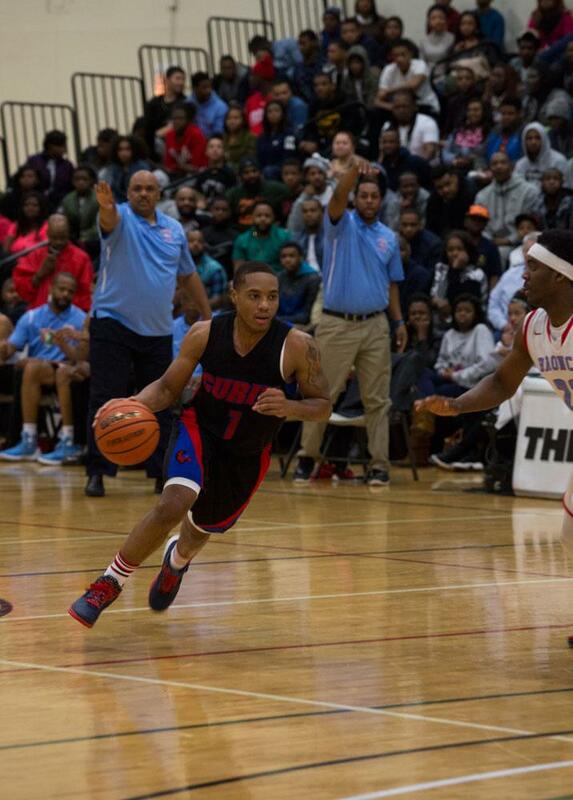 The pain was not enough to keep him out and Curie cruised to an 84-38 win. Gage finished with five points, five assists and two blocks. [dropcap]F[/dropcap]or Gage, DePaul always felt like a natural fit. 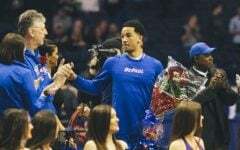 Gage verbally committed in June, shortly after being named MVP of DePaul’s annual summer camp. 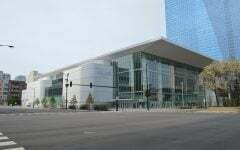 But the prospect of staying in his home city was a decision rooted in family. And it was DePaul head coach Dave Leitao that sold him on family, in addition to his fit on the basketball court. 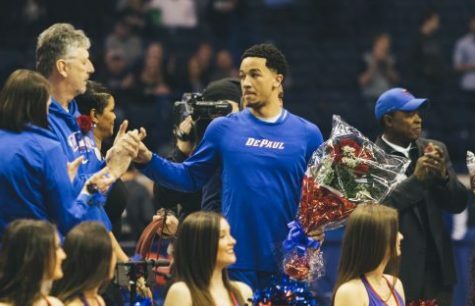 Since signing with DePaul, Gage has made it a priority to record every televised game. 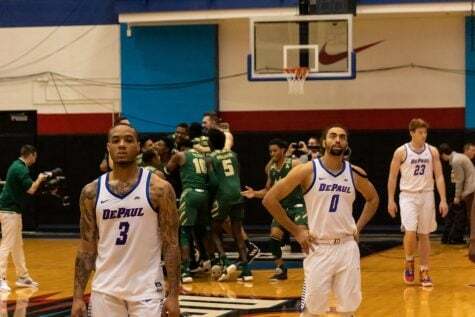 On the first night of the Public League playoffs, he was ecstatic from DePaul’s upset and season highlight win over then No. 11 Providence. “The difference I can make next year is to push it in transition,” Gage said. On the surface, Gage is pegged as a three-star recruit by scouting services such as Scout and Rivals. He fielded other offers from other schools like Bradley and the University of Illinois at Chicago. In a hotbed city of talent like Chicago, however, Gage has also gone unnoticed at times. In a preseason watch list, the Chicago Tribune failed to list Gage as a potential candidate for Mr. Basketball, an annual award given to the best player in Chicago. It further added to Gage’s motivation. “I don’t know any other player in this state who has accomplished as much as he has,” Curie head coach Mike Oliver said. “I don’t think Devin’s lost over 15 games in his career. And he’s playing some of the best players in the country. He should be mentioned. Oliver noted Gage’s tendency to shy away from the limelight. 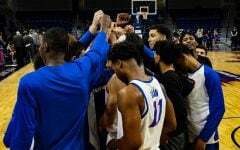 Three years ago, Gage watched as his teammate and one of the most recruited kids in the country, Cliff Alexander, dealt with a herd of fans and press wondering where Alexander would end up in college. Yet playing with Alexander also helped Gage as a player. From his freshman year, Gage made varsity and played with Alexander for two seasons. He watched the way Alexander put in the work on and off the court. And playing with a talent like Alexander created heavy expectations for Gage to fit in right away. They enjoyed success together — winning the Public League playoffs in Gage’s sophomore season. However, that title ended up being declared vacant after Curie was stripped from its title after the Illinois High School Association found that seven Curie players were ruled academically ineligible. 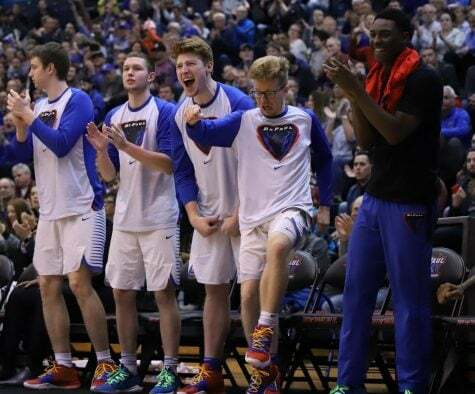 It’s hard to take away the feelings of winning a championship, but Gage was motivated just as ever to make sure Curie comes away with another title. “I know I have to come through for my teammates,” Gage said. [dropcap]L[/dropcap]eitao is in the house. It’s a week following Curie’s win over Taft, and Gage and the Condors are about to face Bogan. The atmosphere in Curie’s gym is completely unrecognizable compared to last week. Students, for one, pack the side of the gym while both sets of bleachers are completely full. Music is blaring as Curie students dance along, all amazingly in sync at certain points. 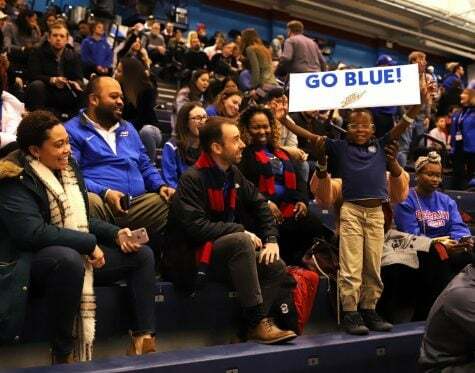 DePaul’s head coach is there to watch his star pupil, but for Gage, this game is a matter of revenge. Last season, Bogan knocked off Curie in the same round of the playoffs. “I had that chip on my shoulder since we lost that game,” Gage said. It’s a tough start for Gage. The senior can’t get anything going and Curie trails because of it. By halftime, the Condors trail 30-24. Gage’s stat line? One rebound, one point. 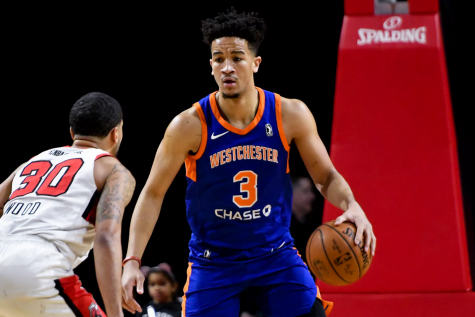 In the fourth quarter, Gage scored six of his 10 points to rally Curie back. With 5:21 left to go, Gage powered through the lane and hit an and-1 conversion to give his team a slight lead. But part of being a point guard and the team’s leader is knowing when to distribute. As Gage drew the attention of defenders, he found teammates Elijah Joiner and Landers Nolley II to carry the offense. Nolley, in particular, came up big late with a trio of 3-pointers to create enough separation for Curie — pulling out a 62-60 victory. 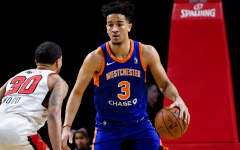 [dropcap]T[/dropcap]o start the fourth quarter in Curie’s next game, Gage clapped his hands together while he stared straight ahead. Again, the Condors are down, this time on a Saturday afternoon against Farragut. Many of Gage’s problems from the Bogan game have plagued him in the first half. He can’t get anything to fall. As his team trails 28-21 at halftime, Gage has just three points. But with his team only losing by two points entering the fourth, Gage is confident. He has already started to find his rhythm, helping Curie erase a deficit. Oliver doesn’t have a doubt — this is Gage’s team. He notes how the rest of his younger teammates look up to him. 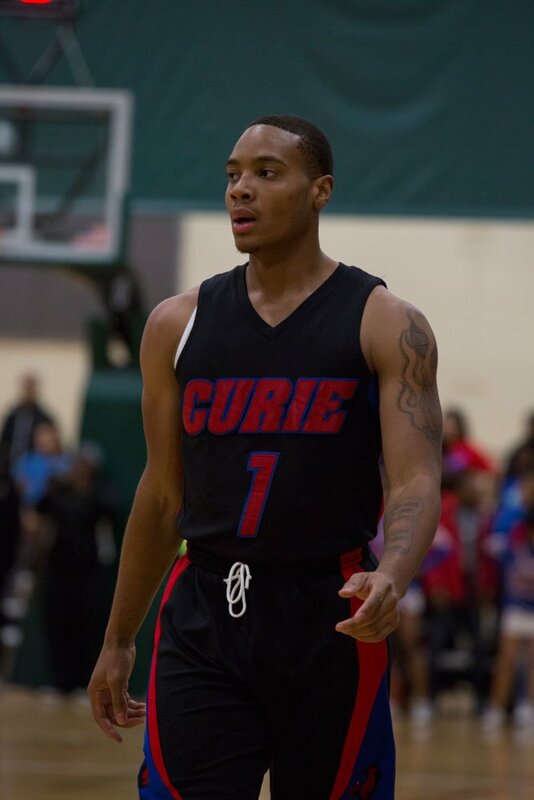 Right on cue, Gage closes the second half with 16 of his 19 points, a reason why Curie storms back to a 59-55 win. He translated his effort on both ends, finishing with four steals as well. With the victory, Curie advances to the semifinals. Two more victories are needed. Gage is almost there. One is dedicated to his grandparents on his father’s side, both of whom passed away within the last six years. On his right arm, he has “Isaiah 9:6,” a scripture often read by his grandmother. On his left shoulder, he has a basketball with prayer hands and flames surrounding it. It’s a tattoo dedicated to his love of basketball and his faith. Those words couldn’t have mattered more against a team like Kenwood, Curie’s semifinal opponent. On Feb. 19, Kenwood was everywhere. Fans packed the Quest Multisport venue, but it was Kenwood’s fans that were the most vocal — rightly so. Kenwood raced out to a 15-4 lead and Curie looked overwhelmed. For Gage, shots weren’t falling. He missed his first three shots. Oliver had seen enough, deciding to bench his star pupil for the majority of the second quarter. While Gage sat on the bench, he watched his teammates find their fighting spirit. Curie stormed back to tie the game at 18 and faced a slight deficit, 20-18, at halftime. With 16 minutes of basketball left to play, Gage needed to decide how to respond. In their biggest game of the season, would he sulk about the game not going his way? Would he fight back? At the beginning of the half, Gage hit his teammate with a crisp assist to give Curie a 23-22 lead. A few minutes later, he scored his first basket to tie the game at 27. In each possession, Gage was finding his confidence. The game continued to be back-and-forth. Each time Gage got to the free throw line, chants of “overrated” came from Kenwood’s student section. And free throws proved to be crucial. With 45 seconds left, Gage got to the line with a chance to give his team the lead. By this point, Gage is 4-of-8 from the free throw line. It has been a tough day. As the noise pours in around him, Gage shoots the first free throw. Clank. The ball bounces off the rim and into a Kenwood rebounder. Timeout, Kenwood. The game is tied at 51. Gage has no time to mope. Defense is now the priority and Kenwood is coming right at him. Kenwood forward Nick Robinson dribbles in place and Gage is stuck in front of him. Gage is waiting and waiting. Oliver is screaming for a five-second call to be whistled for Robinson continuing to dribble in place without moving, but it isn’t called. Finally, Robinson makes his move. He cuts inside and gets the separation he needs from Gage. Gage’s teammate swings over for help, but it’s too late. Robinson is fouled — going 1-of-2 from the line with only four seconds remaining. Curie calls a timeout. There’s still a sliver of hope that Curie can storm down the court to get the basket. With an athlete like Gage, it gives them an even better chance. On the inbound, Gage gets the ball. And he’s off. In two seconds, he makes it to the half-court line where he’s met by two defenders. Get past these two and he has a shot. He has to go for it. Gage squeezes between the two of them — it doesn’t work. He trips and the ball gets away from him. Game over. As Kenwood celebrates, Gage lays at center court staring directly ahead of them. He can’t believe it. Kenwood wasn’t the last high school game for Gage. With the city playoffs over, Curie now has to re-direct their focus towards the state tournament. Gage has never made it past the sectional round. But meanwhile, the face of DePaul’s 2016 recruiting class has time to reflect. He said he knows he should have been more focused as a leader and the need to capitalize on every opportunity. After all, Gage’s true mindset is inked on him — no matter how hard the loss is. 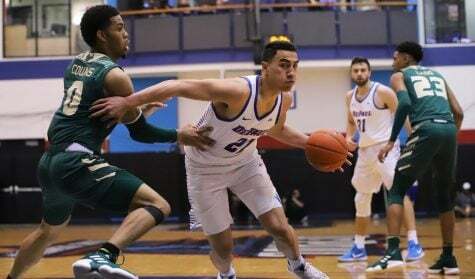 Not exactly the happy ending I was hoping for for the future of DePaul basketball. Going to need freshman to make an impact right away with Henry, Stimage, Simpson gone.